The Colorado Parks and Wildlife Commission, a citizen board appointed by the Governor, is in charge of setting regulations and policies for Colorado’s state parks and wildlife programs. * the following information is taken directly from the City of Boulder government page. Colorado Parks and Wildlife (CPW) has a “two-strike” policy under which bears may be tranquilized, ear tagged and relocated once if they in an inappropriate location (e.g. too far into town), or they have engaged in episode(s) of “nuisance” behavior (multiple visits to town, light property damage, etc). CPW only relocates bears if other less-intensive options such as hazing or community education are not deemed appropriate or effective in that situation. If a bear that has been tagged and relocated is physically dealt with again (tranquilized or trapped due to inappropriate location or nuisance behavior), the bear is put down. Bears that pose a public safety risk will be put down regardless of whether they have ear tags or not. What does Colorado Parks and Wildlife do about bears in town? When are they relocated or killed? The response from CPW will depend on a variety of factors such as location, time of day, history of bear in town, whether the bear is already ear-tagged, and behavior. Every situation is different, but some broad generalizations can be made. Bears often move in and out of town on their own, particularly at night. In these cases CPW will start with educating the neighborhood on bear attractants, often via media releases, volunteers going door to door with information on bears, and/or posting signs. Hazing of bears in town is also encouraged (air horns, banging pots and pans, yelling) in order to make the bear feel uncomfortable around humans. If a bear is seen during the daytime hours, it is often, but not always, up a tree. Bears feel safe up trees and often they have been scared up a tree by human or pet activity when we find them. If the bear is in a location where it can be left unbothered, we will often notify immediate neighbors and leave it alone, or with a City or CPW “bear-sitter” who can keep an eye on the bear and notify neighbors if the bear moves. Often that bear will move back onto Open Space on its own, usually after dark. In some cases, bears attract a crowd and a CPW officer may have to stay with the bear to keep people away and allow the bear to come down the tree on its own. Capturing the bear(s) is a last resort, and will only be attempted if less-intensive management options are not effective or appropriate. If, due to location or behavior, we decide to capture the bear, we take into account the safety aspects of setting a trap or shooting a tranquilizer dart, for both people and the bear. The height of the tree a bear is in, the location of the bear, and the presence of cubs are all factors that are considered when tranquilizing a bear. If the bear has not been captured before, it will be ear tagged and relocated. If the bear is already ear tagged and we are handling it for a second time, it will be put down. Bears considered to be a public safety risk will not be relocated, but will be put down regardless of whether they are ear-tagged or not. The following article written by a Boulder CPW officer explains what the “Two-Strike” Policy is. Nowhere in Colorado Parks and Wildlife’s (CPW) directive on black bear incidents does the phrase “two-strikes” exist. Rather, it states, “Any previously translocated bear that is currently judged to be dangerous because of its location shall be destroyed.” I’m not sure when we started referring to it as the “two-strike policy” but that phrase has outlived any usefulness it may have provided in helping explain the concept. Managing bears isn’t a baseball game and we do not relocate and destroy bears as some form of penalty. This one aspect of the larger policy needs to be put into perspective. Why would we relocate a bear? To move it away from a school or park, to get it out of an urban neighborhood it is not leaving on its own, or to remove it from poor bear habitat it has wandered into (i.e. Broomfield). At times it may be worth it to try moving a bear away from town before it becomes a chronic problem or road kill statistic. For that reason, in late September we tranquilized a sow with a single cub that had wandered into a neighborhood southeast of Broadway and Iris and released it in South Park. This was the first time these bears had been documented in town, there was no history with garbage, they were timid around humans and there was a good relocation site available a long ways from Boulder. The effort was worth it and our fingers are crossed that the sow and cub stay and thrive near the release site. However, if this relocation is a success, unfortunately, it will also be a rare exception. We do not relocate a bear more than once because a majority of the time relocations do not work. All three bears that were killed by CPW in Boulder in September had been relocated and had returned within weeks if not days to their original point of capture, the City of Boulder, regardless of being taken far or farther away. The “CU Falling Bear” was hit by a car as it attempted to return to its original capture location on the CU campus in 2012. In September 2010, CPW killed a mother bear that had a severe injury to its jaw and relocated its cub to Kremmling. Just a little over a year later this same bear, the former cub, was struck and killed by a vehicle near the mouth of Boulder Canyon. Relocating adult bears does not always permanently remove them from an area because bears are intelligent animals that make their living by learning and remembering where food is and they are excellent land navigators. Bears skillfully find their way back to that food. Studies and attempts to relocate bears in other portions of Colorado indicate the same outcomes. Changing the so-called “two strike policy” will not save bears. Relocating a bear over and over again is no better a solution than leaving the bear where it is. In fact it is arguably crueler as these bears face perils whether they stay in the completely new environment or if they journey back. So why relocate bears at all? Why not just leave bears alone? For the most part we do. During the same time period that we relocated the bears from Boulder we did not relocate any bears from any of the subdivisions, campgrounds, or towns located in the foothills and forests (a.k.a. bear habitat) west of Boulder. That’s where bears are supposed to be and it is up to the residents and visitors there to adapt to living and recreating in bear habitat. That doesn’t mean that there are not human-bear conflicts in these areas or that bears never pose a threat to people in these communities but they are very different places than Boulder, a city of almost 100,000 people. We also don’t take action on every bear that comes into Boulder. That’s another way the so-called “two strike policy” has been misunderstood. These bears aren’t “given a strike” every time they come into town. They aren’t even “given a strike” every time they are reported in town. There are no “strikes” for being up a tree and requiring volunteers to watch after them all day. There are no “strikes” for knocking down garbage cans or destroying bird feeders. All three of these bears were given time and many opportunities to find their own way out of town. They were even given encouragement in the form of non-lethal, rubber buckshot/hazing rounds to the backside. All of these bears returned to and then stayed in town over several days to forage in garbage. And why wouldn’t they? These aren’t “bad” bears; they are bears that were taking advantage of an easily available food source. But because of that they were consistently near schools, parks, and houses in a city where no adequate natural bear habitat exists. At some point we have to do something. When we as the agency responsible for managing wildlife in Colorado are presented with situations in which individual wildlife pose an increased threat to human health and safety we have an overriding obligation to take reasonable action to prevent potential injury to people. There is a wide range of public opinion as to what that reasonable action should be. On one end is the opinion that we should never kill any wildlife for any reason. On the other end is the opinion that any large predator’s existence is not worth the risk to human life no matter how small that risk is. What most of us would find reasonable is somewhere in between. There is no way CPW can prevent all injury or death caused by wildlife but under certain circumstances we have to try. 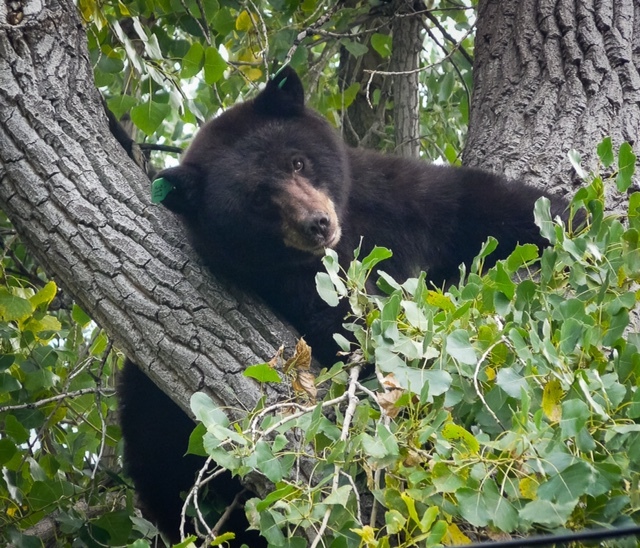 It’s hard to imagine that the same bear using the crook of a cottonwood tree as a hammock for hours at a time could be dangerous and in fact most bears generally are not. When confronted, a majority of the time they will run away or climb a tree—they are not interested in starting a fight. Despite this, bears are responsible for injuries to people in Colorado every year. A woman in Trinidad was injured when she tried to scare a bear away with pots and pans. A man south of Denver was injured when a bear went after his dogs that were on a leash. I cannot tell you if any of these Boulder bears would have hurt anyone with any certainty and I understand that that ambiguity is unsatisfying. We are never going to prevent bears from coming into the City of Boulder altogether and the occasional bear walking down the street, in the back yard, or up a tree is going to be constant so long as Boulder has its open space, lush vegetation, and water sources. I am not interested in “punishing” bears or any other wildlife for looking for food in the city. I do not patrol Boulder’s streets, tranquillizer dart gun at the ready, looking for the wayward bear to send packing. I do not call strikes. I do, however, become concerned when a bear is so habituated to people as a result of constantly eating garbage that it fails to run away or go up a tree when confronted. I worry when a bear is in the city so much that the chance is increased that the bear will have a negative encounter with the many people that travel the same streets and alleys as that bear. So, ultimately, I probably cannot satisfy the many people that are saddened and angered by the deaths of these bears and feel our policies are cruel. There is no absolute answer as to where exactly to draw the line between a bear’s welfare and public safety that we all can agree on. I can tell you that we will continue to favor public safety at the expense of bears. I can also say that a majority of the time bears become a safety threat because of avoidable human actions. So please, forget about strikes and instead focus on the fact that if there was no reason for the bears to stay in town then, figuratively, they would never come up to bat.